Dr Imogen Saunders completed her undergraduate degrees in law and science at the University of Western Australia, and was awarded her PhD from the Australian National University in 2013. Imogen teaches and researches in public international law. Her publications include works on general principles of law as a source of international law, as well as the status of artificial islands in international law. She has convened the International Trade Law LLB/JD elective at the ANU College of Law since 2012. Imogen also teaches in the LLM program, convening and teaching the International Law of World Trade and the Public International Law units. 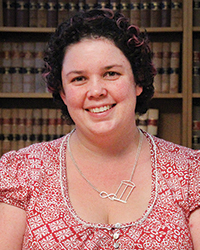 Imogen is currently the Director of Mooting and Student Competitions at the ANU College of Law. She has been the Faculty Advisor for the ANU Phillip C Jessup Moot Competition team several times, and has judged in the Australian rounds of the Jessup competition. She has also coached student teams in other international competitions including the IASLA Space Law Moot Competition and the Red Cross International Humanitarian Law Moot. General principles of law and a source-based approach to the regulation of international security institutions’ in Hitoshi Nasu and Kim Rubenstein (eds), Legal Perspectives on Security Institutions (Cambridge University Press, 2015). 'General Principles of Law from 1875 to 1920 and beyond: tracing a legacy of war and peace through the development of the third source of international law.' Paper presented, Australi and New Zealand Society of International Law 22nd Conference: Towards International Peace through International Law, Canberra, July 2014. 'General Principles of Law and Disaster Risk Reduction: Applying Source Theory to International Disaster Relief Law' Paper written and Presented, Four Societies of International Law Conference, University of California, Berkeley, September 2012 (23pp). ‘Cybercrime and the General Principles of Law’ Paper written and presented, Security Institutions and International and Public Law Workshop , Centre for International and Public Law, Australian National University, 2011 (17pp). Imogen researches in public international law. Her current projects focus on territorality and artificial islands, space law, and general principles of law as a source of international law. ‘When is an island not an island? Territory in the South China Sea – Rocks, Islands and Artificial Islands’ ANU Centre for Military and Security Law Conference, The Law of the Sea in the Asia Pacific Region: Opportunities, Threats and Challenges ,Canberra, August 2017. Korean Association of the Law of the Sea workshop: Maritime delimitation, islands, security and dispute settlement: Korean and Australian perspectives on contemporary issues in the East China Sea and the South China Sea, Canberra, May 2016. 'General Principles of Law from 1875 to 1920 and beyond: tracing a legacy of war and peace through the development of the third source of international law.' Paper presented, Australian and New Zealand Society of International Law 22nd Conference: Towards International Peace through International Law, Canberra, July 2014. ‘Principles and Application of Public International Law: General Principles of Law’ Paper presented, Postgraduate Workshop Program, Australian and New Zealand Society of International Law, Canberra, Australia, 2010. 'Artificial Islands and Territorality in International Law' RegNet Innovations Seminar, the Australian National University, June 2016.